The Museum will be open to the public on Sunday 17th March. Our doors will be open between 2pm and 4pm. All are welcome to come and enjoy the rich, intriguing and sometimes surprising collections that the Society has acquired over the last 300 years. Please come and look round, have a chat to our friendly guides and learn about our history and how it has reflected the story of Spalding, South Holland and the wider world. Entrance is free. Donations are welcome as are enquiries about membership, which is not restricted by gender, despite our name! Our Museum on Broad Street will be open to the public on February 17th between 2pm and 4pm. All our welcome to come and browse our unique and intriguing collections. There is something to appeal to nearly everyone! Our next public opening will be on Sunday 20th January. The museum will be open between 2pm and 4pm. On New Year’s Day both The Times and the Daily Mail ran the story of the wounded German sailors being nursed by the British at Gibraltar in 1937. 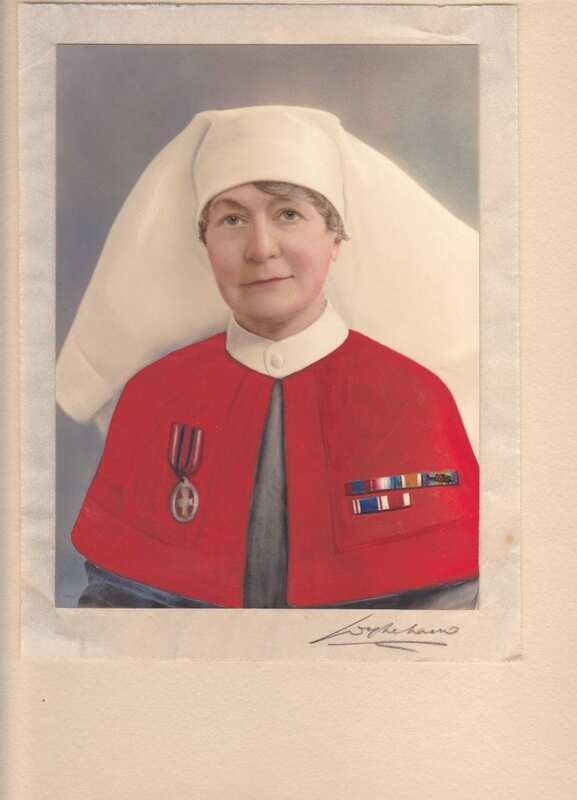 The story featured Matron ‘Madge’ Casswell of Gosberton. Medals and documents relating to this occasion are held at the Society and will be on display for the first time in many years. This lady had the bizarre distinction of receiving citations from both Churchill and Hitler and you will be able to see them at first hand. The Museum at Broad Street will be open to the public on the afternoon of Sunday December 30th. This is an ideal opportunity for visitors to Spalding to take a look at some of our unique collections. Our curator has assembled an entertaining cabinet of curiosities for the occasion. Members please note that the Museum will otherwise be closed over Christmas with no access on our regular Mondays and Thursdays i.e.December 24th, 27th and 31st. The Museum will be open to the public on Sunday October 21st between 2pm and 4pm. There will be an optional introductory talk at 2:15. You are welcome to look around our collections at your leisure and ask questions of our team of guides. Tue 25 Sept at 6pm: Exhibition opening and Civic Society blue plaque unveiling. All welcome. A selection of the Spalding Gentlemen’s Society’s collection of William Stukeley drawings will be on display. These drawings were conserved in 2016 with the assistance of a Heritage Lottery Fund grant. Our Open Day in September will be on Saturday 8th as part of the Lincolnshire Heritage Open Days programme. Our theme is Meet the Ancestors – Share their World. This will be a unique opportunity to view previously unseen images from an extensive collection of glass plates. These form part of a large museum collection with a strong local interest. Entrance will be free. Donations very welcome. 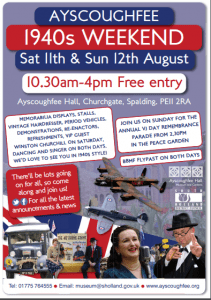 Spalding Gentlemen’s Society will be present at this popular event held on Saturday 11th and Sunday 12th August. There will be displays of memorabilia, period vehicles, re-enactors as well as dancing and a singer performing popular songs of the period. There will be a Battle of Britain Memorial Flight flypast on both days weather permitting.